Money-saving kit includes floor mat brush plus two premium microfiber towels! McKee’s 37 Floor Mat & Cargo Liner Rejuvenator is a two-in-one cleaner and rejuvenator for rubber and vinyl floor mats and liners. This powerful, surface-safe cleaner is formulated using proprietary anionic surfactants that emulsify grease and grime, allowing the mats to be rinsed clean with a rejuvenated appearance. McKee’s 37 Floor Mat & Cargo Liner Rejuvenator features a formula that’s free of VOCs, instead relying on hydrophilic Super Solvents that are 100% water soluble. This advanced formula contains chelating agents that boost the cleaning performance by loosening and dissolving contaminants that cause rubber and vinyl surfaces to dull over time. Routine cleaning with Floor Mat & Cargo Liner Rejuvenator will help prolong the like-new appearance of rubber mats and liners. For most people, a new car is the second largest investment they make. Can you guess what the most popular accessory for a new car happens to be? Floor mats and cargo liners! Keeping a bottle of Floor Mat & Cargo Liner Rejuvenator in your detailing supply cabinet will ensure your expensive floor mats and cargo liner retain a like-new appearance, year after year. If I received a dollar every time someone asked how do I keep this part of my car looking new, or this part, or this part – I would be rich! The key to prolonging your vehicle’s exterior and interior surfaces - tires, wheels, leather, dashboards, and everything in between - is frequent care and maintenance! Yes, that includes aftermarket and dealership installed accessories such as floor mats and cargo liners! 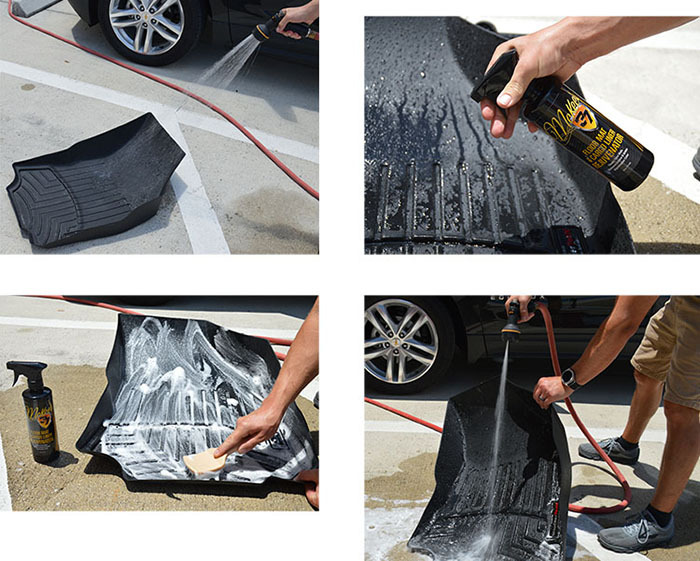 A set of floor mats and a cargo liner is NOT cheap, so why use an inexpensive all-purpose cleaner to remove dirt, grime, road salt, food spills, and pet stains? High-octane all-purpose cleaners will cause pre-mature wear, leaving your BLACK floor mats GRAY over time. Floor Mat & Cargo Liner Rejuvenator is a purpose-built cleaner for the unique requirements of floor mats and cargo liners. After all, why ruin a set of $350 floor liners by using the wrong cleaner? Using Floor Mat & Cargo Liner Rejuvenator is simple. First and foremost, Remove mats and liners from vehicle. Rinse mats with a strong jet of water to remove loose dirt and debris. Saturate the mat with Rubber Floor Mat Rejuvenator. Allow the cleaner to dwell for 30 seconds before scrubbing with a nylon brush. Thoroughly rinse the mats using a strong jet of water. Repeat this process for stubborn stains. Allow mats to dry before reinstalling. Total retail value of $34.96. You save $9.97! great product 5 Cleans very dirty mats really well. Spray on, wait a minute, agitate and rinse off. Pros:Simple to use and effective. Brings the dark factory look back and does not leave a greasy or slippery feel. Floor liner Cleaner 5 Incredible product! Love the deep cleaning of porous ,rubber cargo mats! Cons:Price plus shipping makes it a little pricey but worth it.